VUR stands for Vesicoureteral Reflux. It is a problem of the urinary tract (system that rids the body of urine). 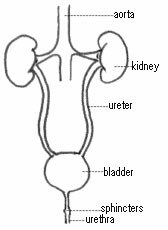 The ureters are the tubes that take urine from the kidneys to the bladder. VUR is when urine flows backward from the bladder into the ureters instead of through the bladder and out the body. Children are born with this condition. In children with VUR, the tubes that connect to the bladder don't work right. The tubes may be too short or the openings may not shut right. Some cases of VUR are caused by high pressure in the bladder. VUR tends to run in families. If a child has VUR, his brothers and sisters should also be tested for it. VUR can be mild, moderate, or severe. The most common sign of VUR is a urinary tract infection. This is because there is often bacteria in urine. If the urine is not released from the body, the bacteria can cause an infection. If your child has a urinary tract infection (UTI), he may need to be tested for VUR. The doctor should take a test, called a VCUG (voiding cystourethrogram), to see if the child has VUR. Infections from VUR can scar the kidney and lead to kidney failure. No. VUR is not contagious. Many children outgrow VUR but still may need treatment. The doctor should take tests at least once a year to see if the VUR has gone away. Treatment also can be used to decrease high pressure in the bladder. Children with severe VUR may need surgery to prevent kidney damage. Surgery is a little different for each child, depending on the child's body and his kind of VUR. Your doctor should know which surgery is best. Surgery for VUR is very successful in correcting the problem. If your child needs surgery, ask your doctor what to expect. It usually involves a 2 or 3 day stay at the hospital. Children who do not outgrow VUR in a few years may need surgery to correct the problem. VUR can't be prevented, but most infections that result from VUR can be prevented. Antibiotics are often used to prevent infection. Children with VUR should take antibiotics daily. Children should have regular tests to make sure there is not a "silent" infection, or an infection that doesn't show symptoms. Some children may need surgery to prevent kidney damage. Call the doctor if your child has symptoms of a urinary tract infection. The most common sign of VUR is a urinary tract infection. Antibiotics are often used to prevent infection. Some children may need surgery.